We welcome you to Christmas past, which is still our Christmas present here at the Jacob Henry Mansion. The Jacob Henry Mansion welcomes you to its annual Victorian holiday. A National Historical Landmark, built in 1873, the Mansion offers a delightful blend of past and present. The gracious mansion is the perfect place to kindle your holiday spirits in its romantic ambiance and exquisite elegant grandeur. 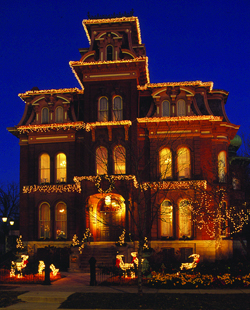 Christmas, the most Victorian of Holidays burns brightly throughout the Jacob Henry Mansion. As you arrive amid thousands of twinkling lights both inside and out, you become a part of a different world. The holly evergreen and mistletoe are abundant in Victorian custom and each room is decorated in its own special theme. The 14-foot Christmas tree beribboned in true Victorian fashion with its gaily-wrapped packages is a cherished custom enhancing Victorian traditions with many warm memories. A Dickens Village glows in Victorian spirit, simple pleasures, good cheer and generous charity. As you enter, you are greeted by a hostess in period costume offering a cup of hot holiday cider. You are surrounded by beautifully carved woodwork of solid oak and black walnut. The grand staircase is a truly gorgeous site decorated for the holidays. Christmas music flowing through will make your Victorian Holidays a memorable experience. So, join our family to share in some of our beloved old-fashioned holiday traditions as we celebrate the cherished season of Christmastime.